The Vancouver Condo Buzz » FIND YOUR CENTRE! Introducing the New Burnaby CENTREBLOCK Condos & Townhouses at UniverCity SFU on Burnaby Mountain by Liberty Homes! FIND YOUR CENTRE! Introducing the New Burnaby CENTREBLOCK Condos & Townhouses at UniverCity SFU on Burnaby Mountain by Liberty Homes! Here is a list of some of the most impressive interior finishes and features at the newest SFU UniverCity condo/townhouse project by Liberty Homes. The flooring will include natural hardwood in the living room and kitchen, porcelain tile work in the bathrooms and beautiful loop pile carpets in the bedrooms. The rooms have 4.5” baseboards throughout. In addition, there are flat panel swing doors, satin nickel levers and mirrored bypass closets. The cabinetry include flat slab doors and drawers, composite stone counters and soft close hardware. The beautiful bathrooms at the presales Burnaby CentreBlock condos and townhomes will include tiled baseboards, dual flush toilet, vanity storage drawer, undermount basin and fully tiled feature wall with floating mirror. The kitchens have high arc, single lever faucet, in sink waste disposal unit, slide in range, counter depth fridge/freezer, under cabinetry task lights and undermount sink with zero radius corners. Some of the in-suite features that are truly exceptional and detailed oriented at the new UniverCity CentreBlock Burnaby condos include overhead lighting in the dining and living room, home network pre-wiring, wall mounted television rough-in and compact laundry unit. There are low flow plumbing fixtures for water consumption and Energy Star rated appliances. Some of the more popular 2 bedroom CentreBlock floor plans will be 2B-2S which has 2 full bathrooms, a U-shaped kitchen and a small deck. The total square footage is around 936 square feet and the master bedroom has a walk through closet. One of the largest 1 bedroom CentreBlock floor plans is the 1 Bed+Den layout called 1B-7NW which is 834 square feet! There’s an open living/dining area with a U-Shaped kitchen and small deck. The master has a large walk-in closet and there’s also a very large entry closet (walk in) and a very large separate den. The exclusive Burnaby CentreBlock townhomes will feature entry and master bath skylights that let in a lot of natural light in addition to a full sized laundry unit and completely finished alarm system. As well, the new CentreBlock Burnaby townhomes will feature a second parking stall and separate parking area with an elevator. There are 2 townhouse floor plans that include TH-2N/S which is 1,510 square feet over 3 floors with a large main floor patio that is surrounded by beautiful planters. The main floor has the dining/living room plus U-shaped kitchen and powder room while the second floor has 2 bedrooms and 1 bath with the laundry closet. The third floor has the master retreat with large sized bedroom, a wall of closets and an ensuite with double vanities/shower and a large deck. The lager TH-1E/W floor plan at CentreBlock townhomes features 1,570 square feet of living space and compared to the former has an even larger wrap around patio and a much larger walk in closet in the master. The preconstruction Burnaby CentreBlock at UniverCity condos will be at the core of a very unique and master planned community that is ideally positioned in the High Street SFU district where day to day services, shopping and dining, the Childcare Centre and Highlands Elementary School are just minutes away. As well, it’s on the east side of the SFU Burnaby campus. Home owners at the CentreBlock Burnaby condos will be able to access most of the university’s extensive facilities (indoor and outdoor) in addition to being just seconds away from all the walking, hiking, and biking trails in the preserved Burnaby Mountain Conservation Area. There’s also plenty of space to reconnect with nature. The project will be highly sustainable and will focus on five key tenets of green design: excellent indoor air quality, responsible construction practises, reduced water consumption, efficient energy usage and low impact site planning. In addition, Burnaby Mountain boasts views that are truly unique and spectacular. UniverCity CentreBlock Burnaby condos will provide exceptional views across the entire region, the Fraser Valley, mountains and water. With this unique vantage point, CentreBlock at UniverCity offers a number of residences that will have unparalleled views in many different exposures. As well, the building will have exclusive penthouse suite, a common rooftop lounge and a sun deck on the seventh floor with panoramic south facing views! If you would like more information about the preconstruction Burnaby CentreBlock apartments and townhome project by Liberty Homes, please visit http://centreblock.libertyhomes.ca or you can also register with us on this page for upcoming launch details. Higher Living at UniverCity SFU Burnaby. There’s a new block coming to Burnaby Mountain real estate district! 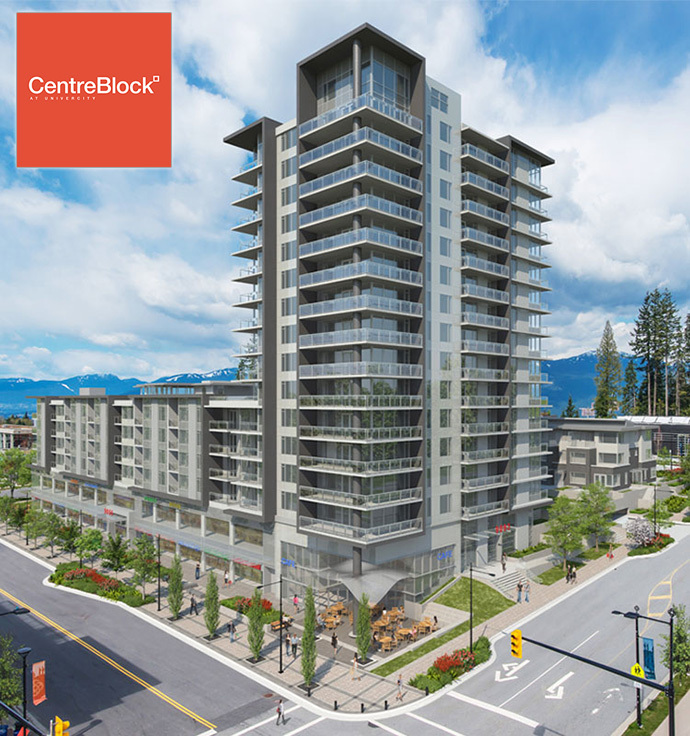 Featuring spacious apartments and townhomes next to vibrant shops and services, the presales Burnaby CentreBlock condos is your home in the heart of it all. UniverCity CentreBlock Burnaby condos are brought to you by Liberty Homes. The project site location is at 9055 UniverCity High Street Burnaby and this will represent Liberty Home’s 3rd and largest addition to the premium UniverCity at SFU neighbourhood that has been a huge success thus far. The CentreBlock Burnaby condo buildings will consist of 184 condos and townhouse units and will feature contemporary living spaces with open concept floor plans ranging between 1 bed and 2 bedroom apartment homes. These are catered to first time homebuyers, students, faculty and even investors. The Burnaby CentreBlock townhomes will be larger and multi-level and will be ideal for professional couples and families, which is a welcome addition to this SFU community. The townhouses will have 3 bedrooms. Centrally located in the heart of UniverCity SFU CentreBlock Burnaby condos is just steps away from new elementary schools, day care, the Nester’s Market and great amenities at Simon Fraser University. The official presale launch is expected for Fall 2013. Now accepting priority registrations online, CentreBlock by Liberty Homes is the 3rd and largest addition to the UniverCity SFU Burnaby campus master planned community. Featuring contemporary and ultra modern living spaces, the open concept Burnaby CentreBlock townhouse floor plans include 26 three bedroom townhomes and are perfect for families and to be a part of the university lifestyle. Not only that, but the new homes also feature both 1 and 2 bedroom spacious homes for sale located at 9055 UniverCity High Street at SFU Burnaby. Just steps from a new day care and elementary school, Simon Fraser University and Nester’s Market, the new project will be launching presales in early 2014. Priority register today for more upcoming details!